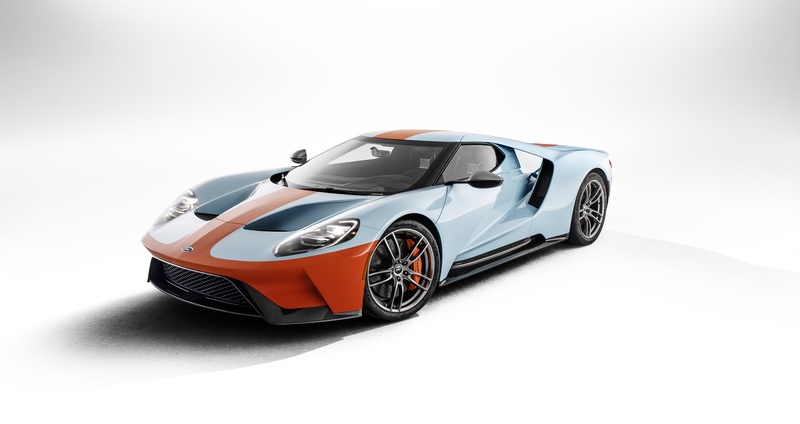 Dearborn-based Ford Motor Co. today introduced the 2019 Ford GT Heritage Edition, which honors the legendary American Gulf Oil-sponsored Ford GT40 by featuring one of the most famous paint schemes in motorsports, plus a set of additional features. Known among racing enthusiasts as chassis No. 1075, the 1968 GT was one of just a few individual cars to achieve repeat victories in the 24 Hours of Le Mans. Pricing information for the vehicle will be released in the coming weeks. For the first time, an optional package provides exposed carbon fiber accents for both the interior and exterior of the Ford GT Heritage Edition. For 2019, the package features the No. 9 graphics on the hood and doors, as well as a ghosted image on the interior door panels. For 2020, No. 6 honors the same car that went on to win Le Mans in 1969 with a different number. The Heritage Edition features exposed carbon fiber A-pillars and sports unique 20-inch one-piece forged aluminum wheels in high-gloss dark stainless with black lug nuts. Orange calipers and silver rearview mirror caps complete the look. Ebony Alcantara wraps the seats, instrument panel, pillars, headliner, and steering wheel. Contrasting blue and orange stitching accentuates the seats and steering wheel, with a new seat embossment inspired by the original 1968 Le Mans-winning car as well as clear and polished anodized paddle shifters. High-gloss dark stainless appliqués accent the instrument panel, door register bezels, and x-brace to round out the interior. Much like previous heritage models, the Ford GT Heritage Edition features a unique serialized identification plate, plus exposed matte carbon fiber door sills, air register pods, and center console.